AOB Travel is data controller for your personal data and is responsible for that processing will be in accordance with applicable data protections regulations. IP-number and information about your use of AOB Travel’s website. Some personal data may be processed since AOB Travel has a legal obligation to fulfill such as accounting or other obligation according to law. The Company store information about you as a customer or partner as long as there is an active agreement. After the contractual relationship has ended, AOB Travel saves personal data as long as a legal claim is or may be enforced concerning the agreement. The Company saves information about you as a visitor of our website and newsletter recipient until you oppose the processing of your personal information. If you object to the processing, AOB Travel will delete your personal information as soon as possible. data provided to us, while third parties, depending on the circumstances, either become independent personal data controller, jointly personal data processor with AOB Travel or AOB Travel’s personal data processor. If you are dissatisfied with how we process your personal data, please contact us, see our contact information in section 12. 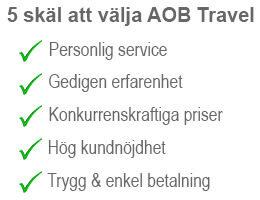 AOB Travel reserves the right to alter and update the policy. If the policy is altered materially or if current information is to be processed in a different manner than what is stated in the policy, AOB Travel will inform about this appropriately. For questions about the policy or requests regarding personal data, please contact AOB Travel.